GCN publisher Scott Lewis, left, welcomes Alvin Pesachowitz, former Environmental Protection Agency CIO, into the Information Technology Hall of Fame. Two former federal officials, Alvin M. Pesachowitz and John A. Koskinen, were inducted into GCN's Information Technology Hall of Fame this month. The pair received their honors, during GCN's annual awards gala, for their long-term contributions to IT management during their government careers. Koskinen, who previously was deputy director for management at the Office of Management and Budget and now is city administrator for Washington Mayor Anthony Williams, led the President's Council on Year 2000 Conversion from February 1998 to March 2000. Pesachowitz, director of IT consulting services at Grant Thornton LLP of Chicago, most recently was chief information officer of the Environmental Protection Agency and oversaw EPA's year 2000 preparations. 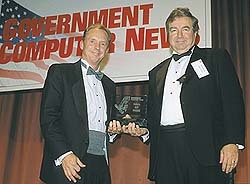 Former year 2000 czar John Koskinen was inducted into GCN's Information Technology Hall of Fame. 'Throughout the 1990s, one of my major contributions has been the electronic dissemination of information,' Pesachowitz said. As head of EPA's Office of Environmental Information, he developed and managed the agency's environmental data warehouse and managed the EPA Web site, which now draws 70 million visitors per month. The greatest IT challenge facing government, he said, is to align agency systems with those of the business community and other agencies. Koskinen spent the bulk of his career as a turnaround specialist for Palmieri Co., a Washington outfit that restructured troubled companies. He put those skills to work for the government in a number of IT positions. 'I organized the task force that ultimately recommended blowing up the Brooks Act,' which regulated government IT procurement, he said. He worked with then-senator, now Defense Secretary William S. Cohen on the IT Management Reform Act of 1996, which replaced the Brooks Act. Koskinen became a familiar figure nationwide as the government's front man for the year 2000 preparations. The rollover to 2000 passed with only minor glitches. 'If I had it to do over again, I wouldn't do anything different,' Koskinen said. Sought once again for his turnaround skills, Koskinen in September joined the troubled District of Columbia government as deputy mayor for operations''out of the frying pan and into the frying pan,' he said. He again plans to work himself out of a job, hoping that in two years the city government's management problems will be past and city administrators will be able to focus on policy issues.